My hair was in need of a wash but I didn’t have any of my products at hand as I had migrated from my home for the week. That is when I purchased my first set of products from Creme of Nature. I bought the Moisture & Shine Shampoo, Intensive Conditioning Treatment and the Strength & Shine Leave-In Conditioner. 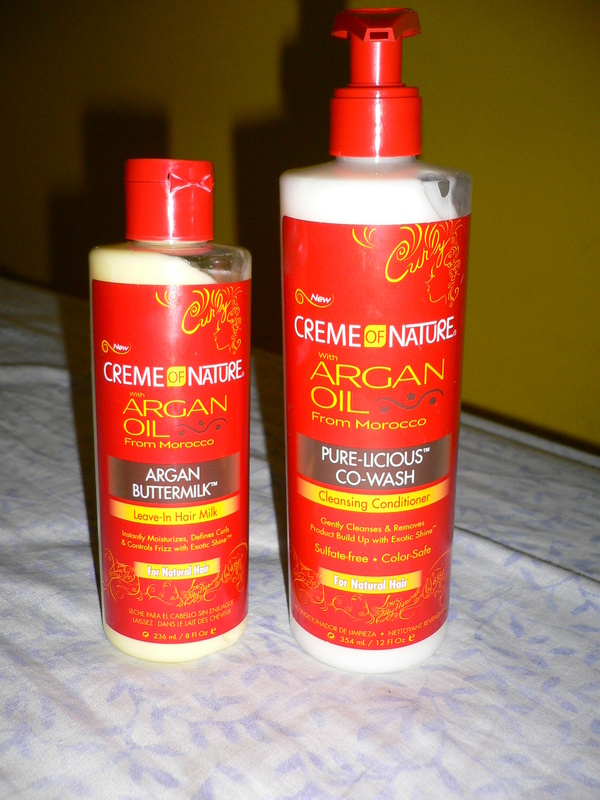 A few months later they introduced the Pure-Licious Co-Wash and Hair Milk, and so I went out and purchased those two products as well… Yes, I have had these products for a long while now, I have even finished a few already…With all that has been going on, I am now getting around to writing this review. As usual I will do my short review of each product I tried, overall the brand isn’t bad at all, I find myself grabbing for the products ever so often. 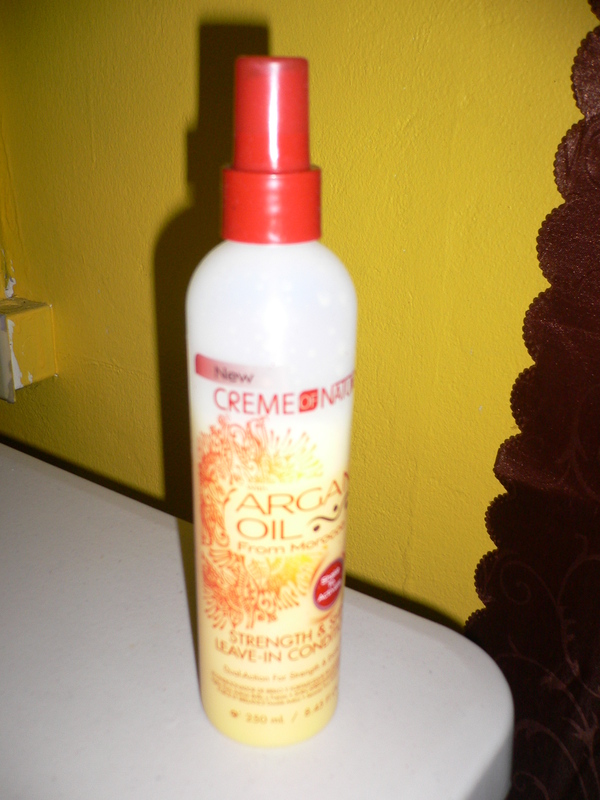 The products has that great smell of Argan oil, which I really like. Texture – It is thick but pourable. Fragrance – Pleasant sweet smell. Suds – It foams up well. 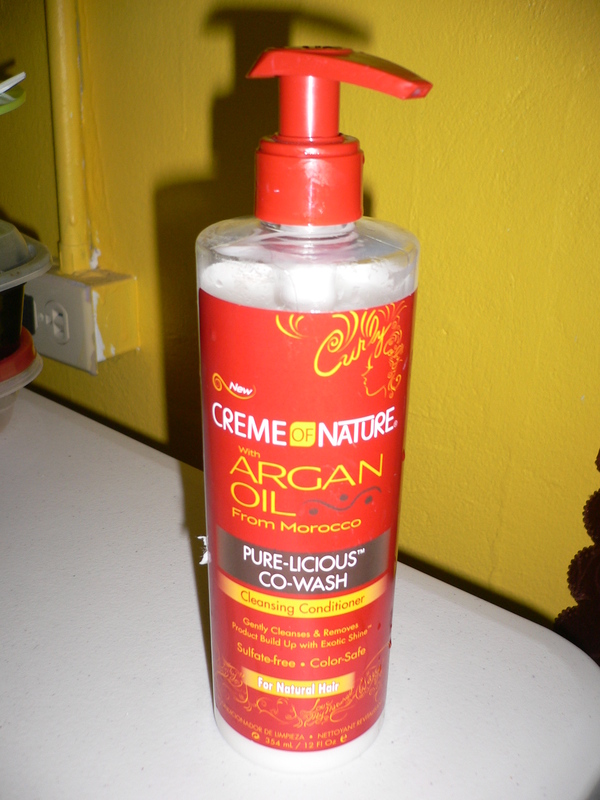 How I used it – I wet my hair and applied it to my sectioned hair, massaging my scalp and rubbing it through my hair. It cleanse very well, it did not strip my hair but had it feeling clean and soft. Texture – It is very thick and creamy. Fragrance – I like the smell a lot, the argon oil fragrance was very distinctive. Slip – Slip is good, as I lightly finger detangled with it. Will I buy it – Yes, I will. How I used it – After I shampooed my hair, I apply a generous amount to my sectioned hair, then I sat under a steamer for 30 minutes. 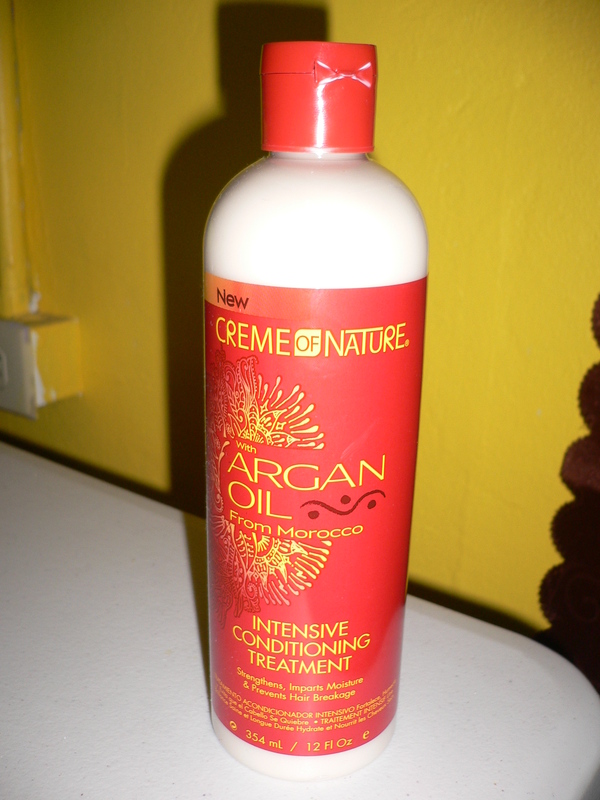 This masque helps in putting moisture back in your hair, strengthens and prevent hair breakage. It leaves hair feeling soft, smooth and moisturized, I liked how my hair felt after using it. I firstly need to state that I had mixed feelings about this product here, but I learnt how to use it and when, it contains protein and thus the first time I used it after washing my hair, my hair felt kind of stiff, it didn’t feel as moisturized as I thought it would, however I guess it had to do with the protein that it contained and if my hair needed that additional protein at that time. So I don’t use this all the time, I used it when I feel like I need a boost and I follow up with another cream leave in conditioner to give my hair that soft feeling. I have been using it recently with my recent breakage( see my previous post). So I think it actually does what it supposed to do, which is strengthen and add shine, you just have to know when to use it and how. Texture – It’s in a liquid form that you spray onto your hair. Fragrance – Similar scent to intensive conditioning treatment, slightly less potent. Will I buy it –It depends, I am not saying yes or no, as I am not sure. 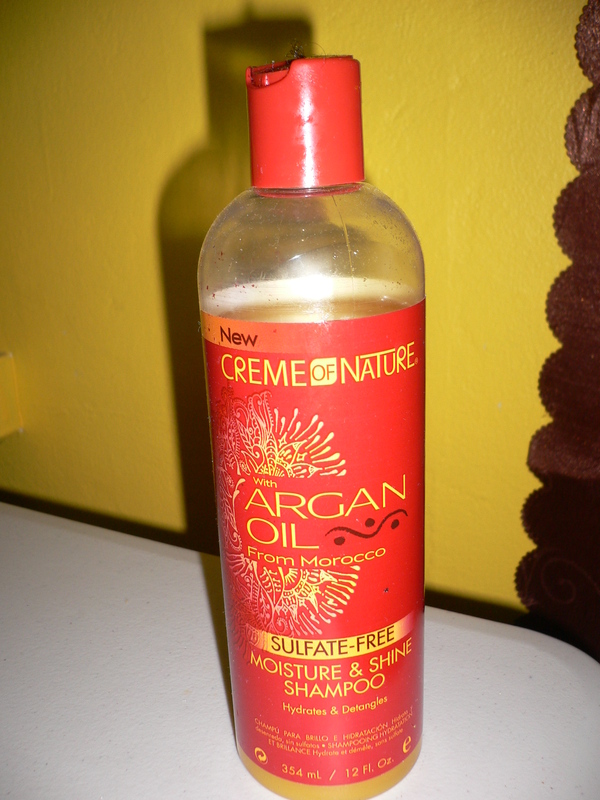 How I used it – After I rinsed out the Argan Oil from Morocco Intensive Conditioning Treatment, I spritz it all over my hair, then rubbed it in with my hands. You are required to shake it well before use, as it tends to separate. Texture – Very thick, probably same consistency as the Intensive Conditioning Treatment. Fragrance – Similar scent to intensive conditioning treatment, but a sweeter scent. Slip – Medium slip, I did slightly finger detangling. Will I buy it –Yes I will, I didn’t need a lot and my hair felt and smelt clean, and moisturized. How I used it – I pumped it into my hands and applied it to my sectioned hair, massaging my scalp and rubbing it through my hair. I loved the pump feature of the bottle. Texture – It is a creamy thick texture. Fragrance – Same as Pure-Licious Co-Wash.
Slip – Did have some slip. Will I buy it – No, I will not. How I used it – On freshly cleanse hair I applied it section by section and comb it through, I also used it as a refresher to top up on moisture in my hair couple days after wash day. I tried really hard to like this product as it left my hair moisturized but I couldn’t, I found myself having to use too much on one section to actually get that moisturized feeling, I didn’t get much use from that 8oz bottle and found that it made no sense to purchase a product where I have to apply quite a large amount to a small sections in order to reap it benefits. I received the Argan Oil from Morocco Moisturizing Milk Masque and Perfect Edges about two months ago, but I haven’t gotten around to trying them as yet, I will post my views when I do try them.